If there's one thing I don't like about Japan, it's that everywhere you go, there are constant reminders to do this, don't do this, go here, go there, and so on. When you're going up or down an escalator, a high pitched polite (usually female) voice tells you to watch your step, hold your kid's hand, stay within the lines, don't put pointy things like umbrellas between the steps, and whatever you do, don't get your long hair caught somewhere (!). On a bus, not only does that high-pitched female voice (probably not the same voice, but they sound alike) tell you what the next stop and the next next stop are, but the bus driver usually repeats that information right after it's been announced. The female voice also tells you to not stand up until the bus comes to a full halt, don't smoke at the bus stop, give up your seat to the elderly...blah, blah blah, every 3 minutes. And as for the trains... it's enough to drive one batty. You just have to tune it out, if you can. I'm sort of trained to listen to and obey public transportation announcements (since they actually mean something in Switzerland) so I'm having a hard time. 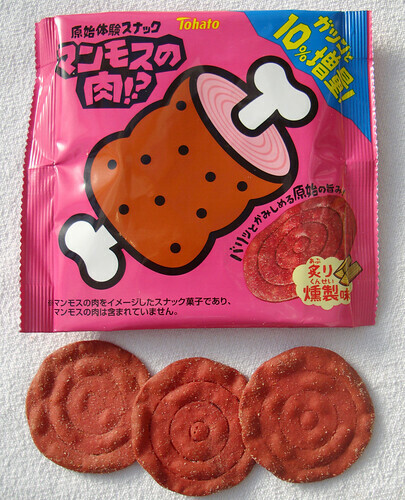 Which somehow brings us to today's Cool (or in this case, wacky) item: Mammoth meat snack! 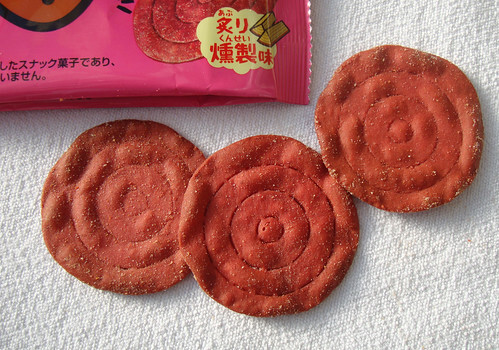 The snacks themselves are small round (a bit less than 2 inches / 5m in diameter) wheat based crunchy crackers with artificial coloring, flavors and something called "pork paste". They are meant to look like slices cut from that round of mammoth meat. They rather resemble flattened, dessicated coils of sausage. They do not taste that spectacular, though they are not totally disgusting either. There is a much more thorough review of the actual taste of this thing on the always entertaining Japanese Snack Reviews blog. It says, "(This is a) snack food that is inspired by mammoth meat, and does not include real mammoth meat." Umm yes, right, especially since mammoth have been extinct for a few million years! Maybe it's aimed at innocent kids who might think it's real mammoth meat - but I prefer to think it's tongue in cheek, almost a parody of all the warnings and stuff you get all around you in Japanese society. Given the obvious World of Warcraft connotation and the sheer fun factor, I am quite surprised that this has not shown up on the J-List snack section yet (Peter, are you listening?). 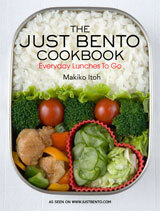 Have you seen it at your local (not-in-Japan) Japanese grocery store? I mean, just imagine the WoW parties you could have with this. Mammoth Meat?! comes in four flavors: Wood Smoked (bright pink bag), Onion (negi) Salt (light green bag), Siberian Salt (yellow bag), and Yakiniku Sauce (red bag). Frankly I could not taste much of a difference between them. Product page in Japanese. Submitted by maki on 2010-01-19 02:25. I usually try to tuned out all the announcement although I usually end up knowing them by heart... But Japan is a parenting state, there is no escaping it! I didn't really notice the warnings when I was in Japan, maybe because I couldn't understand them I filtered them out anyway. Which could also be a potential problem, if that same polite voice would warn people about upcoming typhoons I'd be toast. That snack actually looks rather tasty to me. Almost time for lunch! LOL! That is the funniest snack ever - I have to show it to my man, he'd love the idea of a WoW food themed party! I really hope I can get my hands on it in Europe. Thanks for translating the hilarious warning as well - totally lost to a non Japanese! Wow - leave it to the Japanese to come up with something this fun and wacky! Anyhow, that snack reminds me of the time I picked up a drink my husband translated as "grumpy juice". It was a calpis-type drink, and there was a meter on the side of the bottle that illustrated how you would go from grumpy to ecstatic by the end of the bottle. Just knowing I was drinking grumpy juice made me smile. Have to agree with Laura that sometimes there is an advantage in not understanding Japanese. Several years ago I was on a tour of Japan with a non-asian American man who knew some kanji and some badly pronounced Japanese. He kept insisting that I needed to learn to read Japanese. I explained that if I did, I would be exhausted by the mulitude of neon signs in Tokyo, rather than being delighted by the colors and graphic designs. I'm comfortable in knowing a few polite phrases and being an innocent abroad. I've meet some lovely, generous people this way. -- And had some amusing stories to tell! As to that Mammoth meat: I bet the sodium content is through the roof! I like this idea. If you're not quite ready for a mammoth steak, this is another great option. No I don't play WoW...but I think that 'mammoth meat snack' is something that is available at some higher level - see here. Evidently, people have actually tried Mammoth (though described it as "revolting"): . This got me thinking that if we'd actually find living Mammoths on this planet, people would probably be interested to know what they taste like, or killed for it's precious tusk, fur, or for "research". I met a guy who ate mammoth meat. He was a Dean at my college, the kind of guy who would tell stories about his adventures at Everest basecamp and such. On one of his expeditions with some scientists (I can't remember where this one was), they cooked up a few steaks from a mammoth they found frozen solid. He reported it was very gamey and stringy.